First of all, congratulations on your novel The Suicide being included in Foyles Best Fiction of 2014 list. It's alongside some great novels. It must be nice to get that recognition and be in such esteemed company? It was completely unexpected, especially since the novel met with rejection on this side of the pond. It just goes to show that the Brits have great taste in literature. As for the so-called esteemed company, I don’t know what to say. Your story “The Rainbow Connection” that features in the current issue of PAPER AND INK is about taking solace in the little things when the big things in life may not be panning out so well; whether that be a beautiful rainbow, a good song or even coconut ice cream. Is that the secret to getting through life -- making the most of the little things? You know, it really is. I often tell people who ask me for advice about the writing life to make sure they have something else in their lives, because the business end of writing will kill you. The writing itself is why you’re there. But it’s the rejection and whims of the commercial end of it that wear you down. You have to find some kind of audience, and the system is rigged to make it tough to find one. You have a large fan base in the UK and Europe. Why do you think your work resonates with people on this side of the pond seemingly more so than in your own neck of the woods? There are probably a few factors. One is that, I think, Europeans like reading about an American experience that deviates from preconceptions. Another is that I must have something of a European sensibility. So many of my major influences as an artist are European. And I do think that Europeans have a much stronger reading habit, and that might account for something as well. It’s part of a long tradition, American writers who are ignored in their own country but find a home in Europe. Your Zajack quartet of novels often draw comparison with the work of Charles Bukowski. Do you take that as a compliment, is it a hindrance, or is the connection irrelevant? I regard it as a misplaced compliment since I never set out to imitate Bukowski. But the Zajack novels are in a certain tradition of autobiographical and semi-autobiographical fiction, and as such, comparisons with certain writers are inevitable. Otherwise the comparison is irrelevant. I love the concise simplicity of your prose. No nonsense. Say as much as you can using as few words as possible. Did that style come naturally to you, or is it something that you have consciously developed over time? Actually it took some doing. A lot of doing. In the beginning, I thought that great writers were by necessity prolix and convoluted and I wince now when I look at some of my very early overblown attempts. As the years went by I found myself stripping the prose to the bone more and more. I had models in this: Georges Simenon, mostly. And that’s strange, because I read him in translation. Which writers were your biggest inspiration to pick up a pen and paper yourself when you were growing up? Well, the first writer who really made me think that it was possible that I could be a writer was Henry Miller. He came from something of a similar background and, like me, had no encouragement. I saw a great possibility in the Simenon roman durs or hard novels – they were something I thought I might be able to emulate, at least. There were many other inspirations as well. Hamsun. Paul Bowles. Isaac Singer. Dostoyevsky. Celine. Going way back, Dickens. Balzac. I always thought Ross Macdonald was a great genre writer. And many more I’m neglecting to mention. Who are your favourite writers at the moment? Well, most of them are dead. I like the French writer Emmanuel Carrere. I was a great fan of Patricia Highsmith back in the seventies and eighties, before the current generation -- very successful novelists who are becoming associated with her and have nothing in common with her complexities as a writer -- discovered her. I’ve enjoyed some of the Houllebecq I’ve read. I’d probably enjoy more French writers, but the language is too much work for me. Ah – I like Ryu Murakami, the Japanese novelist. There are some really good writers, like Sam Millar, who I haven’t read enough of. Jason Starr. Dan Fante is a good friend who I read. I liked Tony O’Neill’s Sick City. But I’ve just had a run of five or six novels I couldn’t get through and abandoned at various stages, not being one of those readers who feels obliged to finish everything I start. I won’t mention any names. I have always thought that your work would lend itself well to film adaptation. I could easily picture The Suicide or No Strings on the big screen. Would you be open to movie adaptations of your work? Absolutely, yes. Readers often mention that to me. And I’m not a stickler about faithfulness to the original material. A filmmaker has to take liberties, you would expect that. Anyway, there has been some interest in the past, a couple of options taken on my earlier novels, but so far nothing’s come of it. In one case a director shot nearly half of one of my original screenplays and abandoned the project when he couldn’t come up with funds to finish it. Very discouraging, since it starred an actress who has since gone on to a solid film career. In an ideal world, if you could pick, which director would you want for the job? Or would you fancy trying your hand at directing yourself? I’m fond of saying – having worked in the film world – that it takes a million bucks to put in a plug on a movie set. To do it half decently, it’s a very complicated undertaking, and every time I think of trying to do something myself, I think better of it and go straight back to the typewriter. Regarding your other question, there have been so many great directors. Too bad Minghella died. He did an incredible job with The Talented Mister Ripley, in some ways improving on the original material, which was great in itself. Polanski in his heyday would be fantastic. Bergman, of course. No one’s ever done a better job of making a film than Nicholas Roeg on Don’t Look Now. I’d take any of them, of course. And I know I’m neglecting to mention scores of great filmmakers. Mind if I give you ten or fifteen since I can’t stop at just one? Welles’ truncated The Magnificent Ambersons. Chinatown. Repulsion. The Servant. Séance On A Wet Afternoon. Angel Heart. Fanny And Alexander. The Talented Mister Ripley. Purple Noon was a good one too. Last Tango In Paris. Burn. The Last Emperor. One Deadly Summer. Betty Blue (director’s cut). The Vanishing (the original Dutch version). Bitter Moon. Damn, I’m short on American titles, aren’t I? Anyway, there are lots more, but I’ll stop there. If you could get drunk with any three famous people, dead or alive, who would they be? I know I should say Picasso and Einstein and Shakespeare. But I’d take my chances getting drunk with the young Raquel Welch. Jayne Mansfield, she of the genius IQ. The young Bardot. I’m not stupid. To hell with the guys. What is your stance on e-readers? Is the demise of the printed word inevitable or is there still hope for those of us that prefer our words on paper, printed in ink? It’s my observation that you cannot stop the march of technology. Eventually the e-readers will win out and the traditional form will be a specialty item. But maybe I’m wrong. What is next for Mark SaFranko? Are there any more Zajack novels in the pipeline? I’m always working on something. Two more Zajacks are finished but not yet published, and I’ve started another. But I’m also working on a few other novels. One is about a lesbian violin prodigy that takes place over her long lifetime – not something people would expect from me. But I’ve written around thirty books, so the vast majority of my work remains unpublished. Oh, and there’s another studio album coming out, a collaboration between myself and an Irish songwriter by the name of David Noone. I wrote the music and produced the album and he did most of the lyrics. It was an interesting project for me in that I was freed from worrying about words for a change. Thank you for giving up your time to answer these questions, Mark. It is very much appreciated. 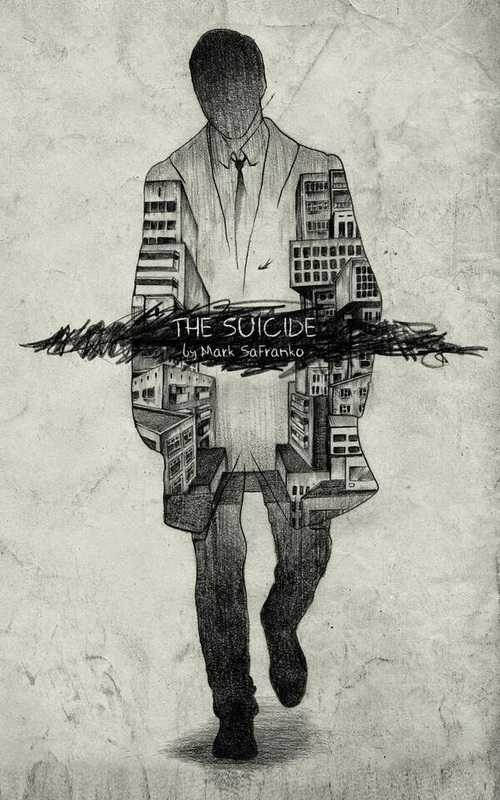 Mark's novel The Suicide is available through Honest Publishing and his Zajack novels are available through Murder Slim Press. His story "The Rainbow Connection" features in Issue #4 of PAPER AND INK LITERARY ZINE which is available here and here. Wow! That's so awesome that you got to interview one of your favourite writers! Did you get to meet him in person? Unfortunately not. Behold the joys of e-mail.